Whatever your Project is I can provide you with the Design and Architectural documentation necessary for Building Approval. Most of my work is for owner builders who want to coordinate the job on-site for themselves to save costs. I can however provide full Architectural services if required. This project started construction in Dec 2017. The existing building was set over 2 house allotments and a third allotment at the side was used for car access. The scheme was to build an infinity pool on the third allotment and place a new 160 sq. m. pool-house behind the pool. The pool-house is essentially a lounge/ bar and guest accommodation. The roof of the pool-house will generate enough power to supply the house and pool with both power and heat. It will be constructed from a product called Tractile. This unique Australian product is not a seperate PV cell that sits on the roof cladding but instead the PV cell is the roof cladding. The Cells are cooled with a built in water jacket which increases efficiency. The waste hot water can be used to heat the pool as well as the concrete slab. This project finished construction in Feb 2015. The existing building was a tiny cream brick Jennings Project home that had been used as a rental property for 20 years. The owners wanted something modern and light. The result was a major refurbishment of the existing building plus providing a new living area and deck covered with 10mm cellular tinted polycarbonate sheeting. This rural home finished construction in 2013. The outer cladding and stone walls still needed to be built when this picture was taken. This country residence has provision for most equine activities, including day paddocks, feed lots, barns, cross country trail, and an arena. The clients had an idea what they wanted and used my services to provide planning knowledge, passive solar design and 3d visualisations to refine their ideas. As this is a rural property additional measures had to be considered to comply with bushfire protection provisions and the native vegetation act. Enough documentation was provided to get a builders quote and the builder provided working drawings from my Cad plans and 3d sketches as part of his contract agreement. This saved the owners around 4K on Architectural drawings. This is usually not a recommended practice as it gives the builder more control as to the detailing, cost and look of the building. If the builder is trustworthy this is not an issue, but the additional variations that can result from an under-documented building usually far outweigh the small savings made on the working drawing cost. This project is at Planning stage in early 2015. The existing building was a small stone cottage that had been lovingly restored by the owner. The property is in a high fire risk Hills-Face zone. This prompted the extension being designed on the side of the home furthest from the street in order to cause minimum visual impact to residents of neighboring properties. This aspect also gives much desired views towards the city and beach. Much work has been undertaken clearing out olive trees and other exotic weed species. Re-vegetation of the area is being undertaken so fire-resistant species can be selected for areas adjacent the house. This will minimise fire risk whilst still maintaining the effect of the rural/semi natural setting. Additional living space was needed and a living room, study, kitchen, master bedroom and verandah is designed to the rear of the property. An old stone rainwater tank is to be built over and used as a cellar. Stone and render compliment the existing cottage and the result will be a sympathetic extension that still allows a modern lifestyle. This project finished construction in late 2014. The existing building was a tiny red brick Bungalow that had been lovingly restored by the owner. The area was a listed streetscape and the owner and council required any upgraded to the front yard to be in keeping with the adjacent houses. A woven wire fence was detailed accordingly. 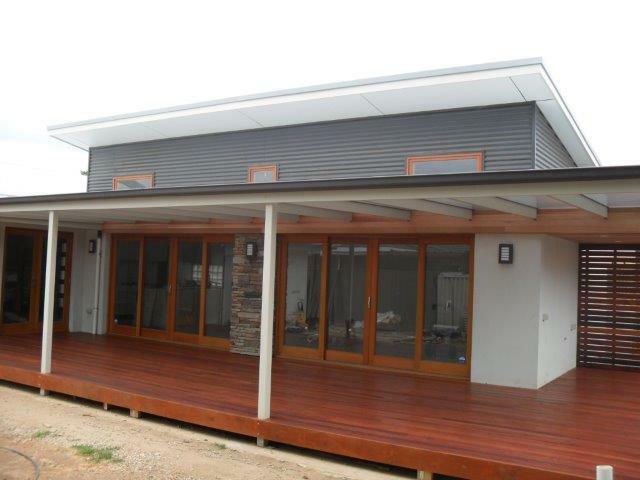 Additional living space was needed and a new carport, living room, 2 bedrooms and verandah was added to the rear of the property. 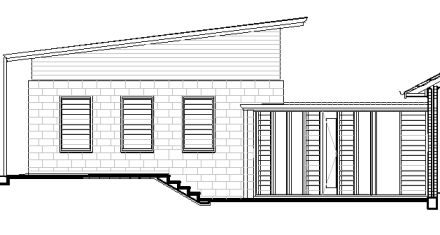 The verandah (sketch pictured) was designed in similar style to the front porch of the house. Multiple pairs of french doors connect the new living room with the outdoor areas. The owner wanted something to match the 1930's period externally but with a more modern twist to the inside. The result was a sympathetic extension that still allows a modern lifestyle. 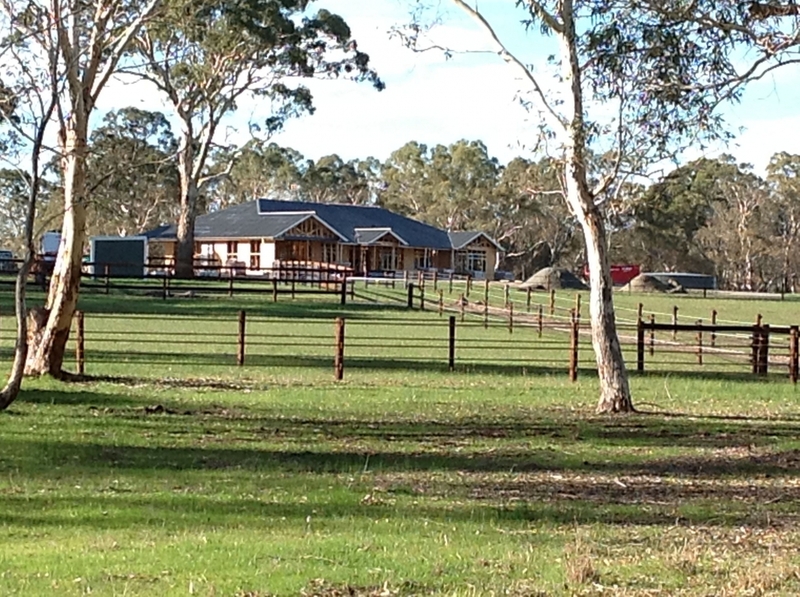 A very keen Owner Builder undertook this project taking 4 years in total. The Original building was renovated, including the Master bedroom Ensuite before the New Extension was started. This enabled the occupants to live in comfort throughout the new works. This is first stage of a 2 stage project. 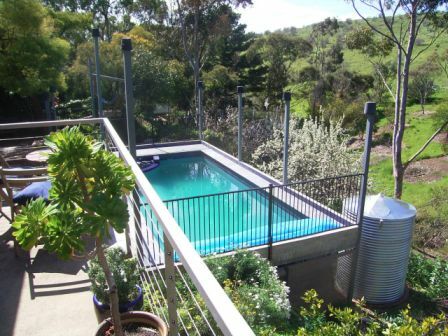 The pool adds drama and sophistication to the semi rural setting. A glazed pool enclosure is yet to be built around the pool. The steel columns for this room are integral in the design of the pool. The corrugated steel rainwater tank with traditional cone top allows for water-line top-ups. It presently uses the pool surface for catchment but when the enclosure is built the new roof will fill the tank. The pool uses an ioniser for sanitisation and so is basically fresh water. This means the tank should not rust in the interim. The brief was a new Bedroom with Day-spa style Ensuite and a new Cellar. This is a 3d study at the Sketch Design Stage. The client liked Brutalist 1960's architecture & wanted something out of the ordinary. 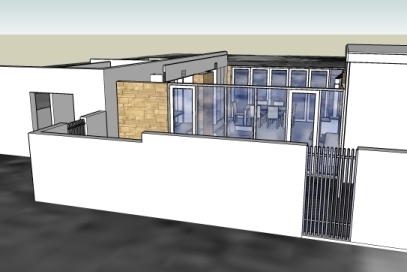 The sloping site was making the proposal hard to visualise for the Clients partner so a 3d model was created. 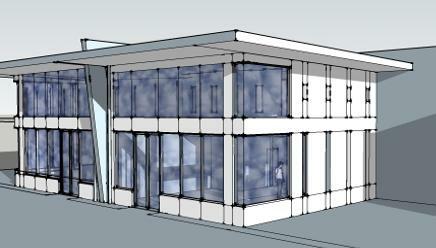 The brief was to design a new Showroom and Office module with flexible tenancy areas. The new building was designed as two separate mirror image Tenancies that could be used as one space if needed. 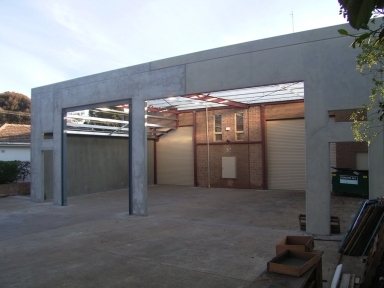 The existing Warehouse was to undergo a full renovation including new wet areas. 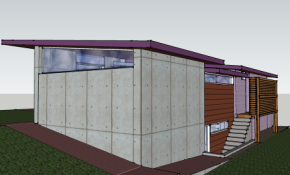 The sketch design phase included drawing a 3d model in Sketchup. The existing house is linked to a separate study which is accessed from a large enclosed verandah. 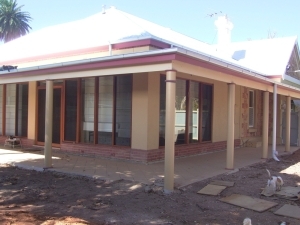 The brief was to change this verandah into a new enclosed family area with study, dining, living, and new WC. All within a very tight space and to a tight budget. Sketchup was used to create a 3d model of the proposal. This was inserted into Google Earth to assess solar impact on the large expanses of glass.